When I went to The Body Shop's HQ I got to get a sneak peak of The Body Shop's press kit for coming Christmas. It comes with new products such as the Body Mists, Vineyard Peach body lotion and butters, a new range of eau de toilette, parfume oils and more. I was lucky to get couple of products to test it out. I would like to share my experiences with The Body Shop's Japanese Cherry Blossom, Mango Body Mist and lastly their Vineyard Peach Body Lotion. 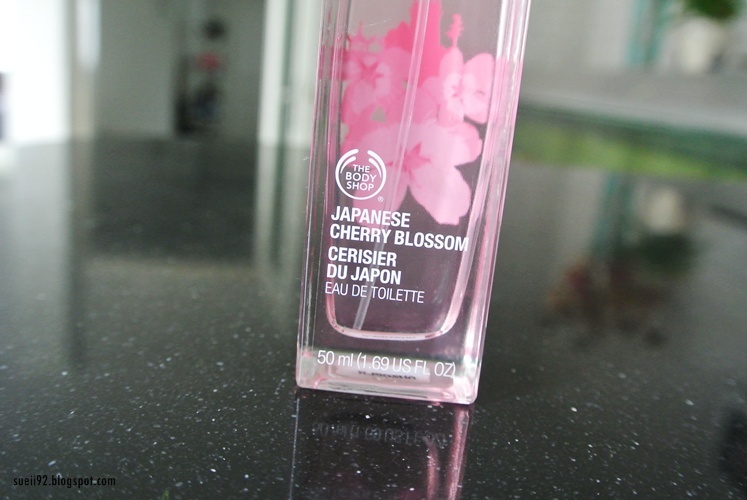 The Japanese Cherry Blossom is one of the four eau de toilettes in their new line if I'm right. Each eau de toilette is specially made from a speciality of a country. As the name already says, this Japanese Cherry Blossom has a very fresh flowery scent, which I really like. But I believe this is already a known scent in the The Body Shop stores. 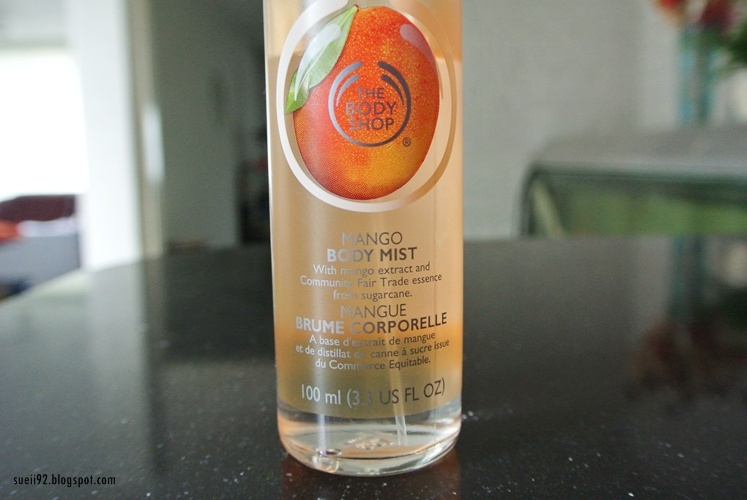 This Mango Body Mist is a new product which I was excited to try. It contains mango extract and Community Fair Trade essence from sugarcane. It's also available in sea, coconut, strawberry, grapefruit, moringa, vanilla and satsuma. I chose the mango because in my opinion it smells the best. For something to spray it all over your body I love fresh scents. And this one smells so good! Smells very fresh and sweet at the same time. I love to use it after shower, before going to bed and before going to work! The scent doesn't last for a very long time though, I think it last for a couple of hours. 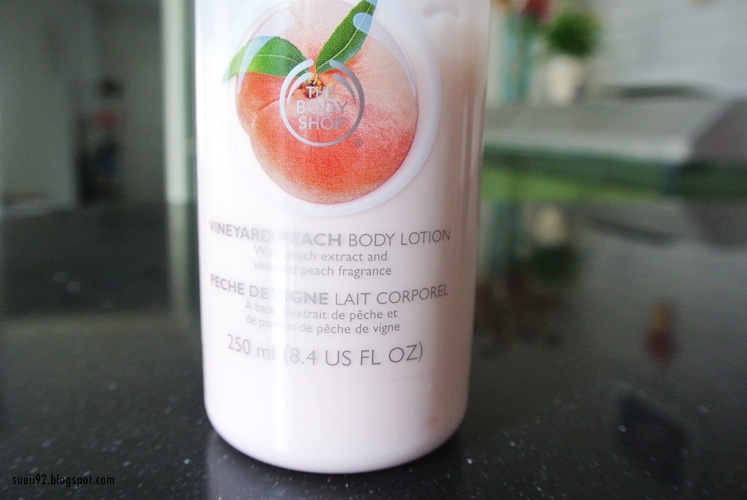 And now also one of my favourite of the three: The Body Shop Vineyard Peach Body Lotion. As soon I saw the Body Butters and Body Lotion in Peach in the press kits I was really excited because I could imagine the freshness and sweetness scent of peaches combined with a lotion or butter. Oh my gosh, how I am in love with this scent! I really don't know how to explain it, but you have to test it at the counters. The consistency compared to the original butters is very thin and I'm surprised how fast this dries. This body lotion dries in 5-10 minutes, which is really handy for me to apply in the morning after shower since I don't have a lot of time in the morning, but feel the need to keep my skin hydrated. But as for the results, my Moringa Body Butter lasts the hydration of my skin much longer than this body lotion, which is quite logical. As I already said this body lotion is quite thin and dries very fast, where as the Moringa Body Butter is quite thick and need time to dry. The Moringa Body Butter last the hydration for 24 hours, whereas the Vineyard Peach Body Lotion lasts for around the 16 hours. As you could read my last post about the updates and what's been going on in my life now, you know that I'm going to be an intern at The Body Shop Benelux starting from end of August. I am lucky and honoured to be their intern and love the products that I can try out. And of course I'm more interested in The Body Shop than ever before. To be honest, at first I didn't really experienced The Body Shop products. I've never really heard of them and only know that they have a lot of stores in Holland and that they have several environment statements. But I've never really bought their products because I find it bit expensive sometimes and didn't really know their products. So for my own interest of The Body Shop products I will buying more of their products in the future and will review them with my 100% honest opinion, despite the fact I'm going to be an intern. In other words, even if I will be working for The Body Shop as an intern, I will be testing their products (free or bought it with my own money) I will still review it from an objective way, which is my 100% honest opinion. If I really don't like the products I might not even review them on my blog. They have sometimes sales. For example they have now XL packaging for body butters and shower gels in stores. I just bought a XL Mango Body Scrub 300ml. Their scrubs are amazing, will be doing a review soon! Disclaimer: I received these products for review consideration. I am not paid to review these. For more information, please read my DISCLAIMER. Labels: Japanese Cerry Blossom Mango Body Mist press kit sneak peak The Body Shop Vineyard Peach Body Lotion. You should! Love the smell of The Body Shop products :D Very hydrating too!